Heather will be appearing at the 2018 Fox Cities Book Festival in Appleton, Wisconsin October 8th and 9th. Long time Wild Ones member Heather Holm, author of such books as Pollinators of Native Plants and Bees, will be featured at this year’s Fox Cities Book Festival in Wisconsin. 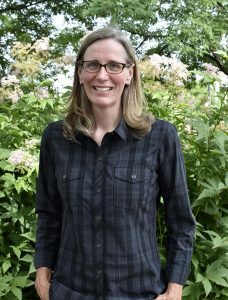 On Monday, October 8th at 6:30PM, she will speak at the Elisha D Smith Public Library in Menasha about “The Pollination of Native Plants,” and on Tuesday, October 9th at 10:00AM, she will speak at the WILD Center in Neenah about “Gardening for Bees and Butterflies.” Copies of her books will be available for sale at both sessions. Heather had an avid interest in natural history and botany at a young age, and spent much of her childhood exploring the woodlands and prairie on the family property, established by her great great grandfather in the 1850s. She studied horticulture and biology at the University of Guelph and later web programming and digital design at Seneca college, Canada. Genus Chrysotoxum, a genus of hoverflies, nectaring on a Purple Prairie Clover (Dalea purpurea). Heather currently lives in Minnesota with her husband. 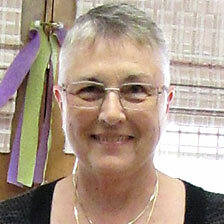 She is a self-employed author, designer, and publisher. For the past few years, she has been assisting with native bee research projects. The most recent research project was a two-year study to determine the types of native bees present in cultivated blueberry farms in Minnesota and Wisconsin. 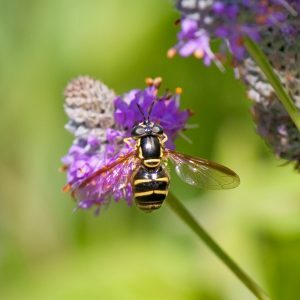 The study included developing customized plans to enhance and expand both forage plants and nesting sites for bees within the farms. In her spare time, she is an active community supporter, writing grants and coordinating neighborhood volunteer landscape restoration projects. Currently, Heather is working on three projects with volunteers, restoring approximately ten acres of city-owned land in her neighborhood for pollinators and people. Heather’s website is Pollinators and Native Plants. Wild Ones Fox Valley Area Chapter is delighted to co-host, along with the Outagamie County Master Gardeners Association and the Paper Valley Garden Club, to bring Heather Holm to the Fox Cities Book Festival. Heather’s timely topic lends itself to the goals of the hosting organizations. Plan to put her information to good use in participating in the Spring Plant Sale Trail scheduled for May 18, 2019. The Book Festival runs from October 8th thru 14th. To learn more about the other authors and their venues, go to Fox Cities Book Festival.